The VR world also helps patients relax by interacting with floating spheres in an animated landscape while listening to music. What if there were a safe space for patients with an addiction to practice saying "no" to drugs or alcohol? A Tennessee graduate student is experimenting with virtual reality to deliver just such therapy. In this virtual reality experience, the patient can walk to a "bar," hang out with "strangers" and say "no" when someone offers the participant a drink. 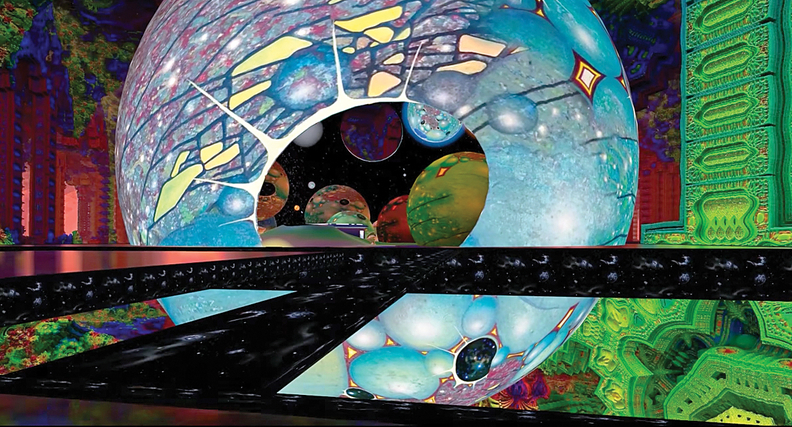 They can also relax by interacting with floating spheres in a colorful, animated landscape while listening to music. "This world kind of helps them escape their own realities and come into a completely abstract universe and then deliver a therapeutic intervention," Noah Robinson, a Vanderbilt University clinical psychology graduate student, says in a video explaining the therapy. "If you can create an intervention that is as accessible for the addict as the drug, perhaps they can choose the intervention over the drug," Robinson told Research News at Vanderbilt. Robinson has partnered with a Nashville-area rehab center to let its patients try his treatment method from initial intake through post-treatment. "VR can help regulate their emotions as a substance might, but it's not physically addictive," he said. The low-risk, high-tech therapy method in development could offer an alternative to seeing a therapist. "Instead of having to wait until the next day to go to a meeting or wait until the next week to see their therapist, they can immediately put on the headset and be removed from all the cues related to what's prompting them to want to use the drug and get some of the support that they're seeking."